The Bizango people are sorcerers. The society is known to deal with necromancy as well as use Loup Garou and Djab as guard or attack creatures. Bizango is a secret society in Haiti that punishes those that commit crimes. The worst offenders are given the infamous zombie powder. Not much is known about these societies as you must be invited to join and they don't talk about it. The secret Bizango society is considered the most extreme Petro Sauvage. The Bizango statues are kept in the society’s temples where the society’s members consult the Lwa in order for them to fulfil their duty as nightwatch. At night, they roam the streets to pick up and punish people who have misbehaved. The Bizango society is definitely not a criminal gang. They support people in distress, and mete out punishment where necessary. Haitian Vodou also written as Vodun or Vodoun (in English Voodoo) is a syncretic religion that originates in the Caribbean country of Haiti. It is based upon a merging of the beliefs and practices of West African peoples (mainly the Fon and Ewe; see West African Vodun), with Arawakian religious beliefs, and Roman Catholic Christianity. 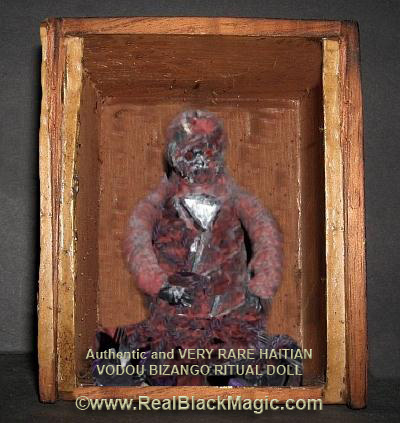 Vodou was created by African slaves who were brought to Haiti in the 16th century and still followed their traditional African beliefs, but were forced to convert to the religion of their slavers. Practitioners are commonly described as Vodouisants Vodouisants believe in a supreme being called Bondye, but also worship many lesser spirits, as the loa. This belief is held in several West African religions, such as that of the Yoruba, Odinani, and Vodun. When it came in contact with Roman Catholicism, the supreme being was associated with the Judeo-Christian God, the loa becoming the saints. Haitian creole forms of Vodou exist in Haiti, the Dominican Republic, eastern Cuba, some of the outer islands of the Bahamas, the United States, and anywhere that Haitians have emigrated to.